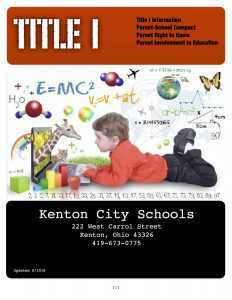 We would like to welcome you to Kenton City Schools’ Title I program. We are excited to work with you on this important partnership of learning. The Title I handbook is provided to help you understand the Title I program currently operating in our school district. Please take a few minutes and read over our program and how our service model is designed to help all students. We encourage you to consider participating on a building level Parent Involvement Committee. Committee members provide input about our Title I program and give us ideas for Title I Family Engagement events. If you would like to get involved, please contact Michelle Wise at 419-673-7248. We value input from our parents and community. On behalf of Kenton City Schools, we wish you and your child a successful year of learning. We thank you for your support and engagement in our Title I program. Title I Annual Meeting information and slideshow.